Having the right cutting tools for a certain project can help simplify the process and help you create the best design. There are various types of cutting tools, all designed depending on their purpose. Today we will be covering which best metal chop saw can provide you with the best metal-cutting experience! What exactly is a metal chop saw? A metal chop saw is a term generally used for cutting various types of metal. Its usual design is a motor and cutting wheel mounted on a rotating arm and connected to a base plate that is fixed. It can easily cut through cast iron, i-beams, sheet metal, steel pipe, or chunky angle stock. 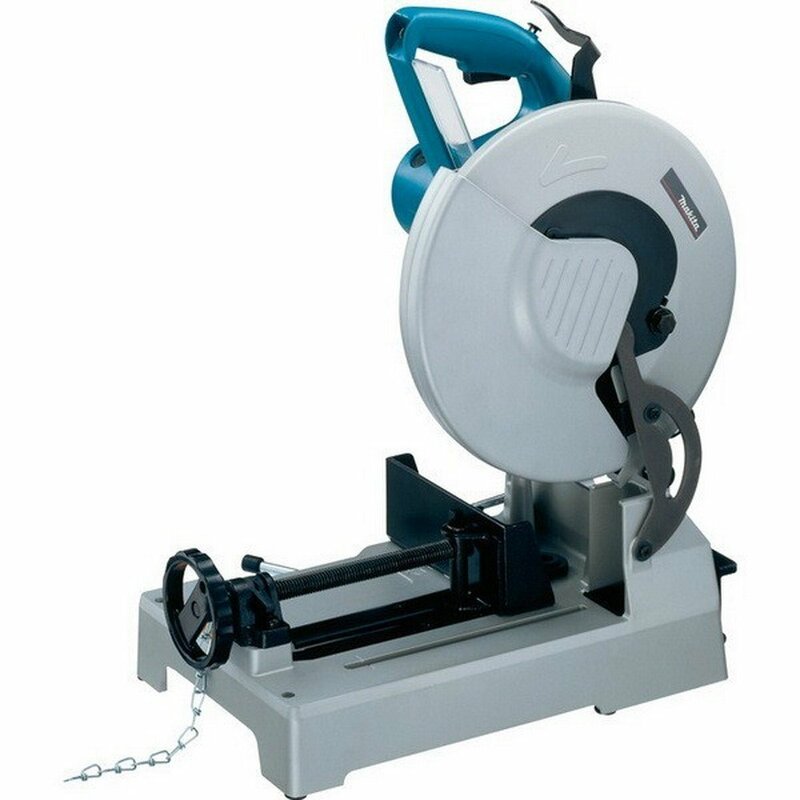 Metal chop saws are commonly used for cutting mostly rigid materials at a fixed angle. They usually have an abrasive blades or cold saw blades (more about these blades later on). John Cappa of the Four Wheeler Network says that a metal chop saw is a tool for efficiently making rough cuts in the tubing, bar stock, and even steel plates in vehicles. It is usually designed to drop down and cut with a chopping action. Get a metal chop saw if you have huge metal cutting projects to work with. It will lessen your cutting load. If you want precise cuts, then this type of saw works definitely well for you. There are many chop saws available on the market today. All brands have different features and benefits, depending on your preferences. If you are looking for the highest grade metal cutting chop saw, there are many factors to consider. These considerations include but not limited to industrial performance, quality, motor power and blade type. 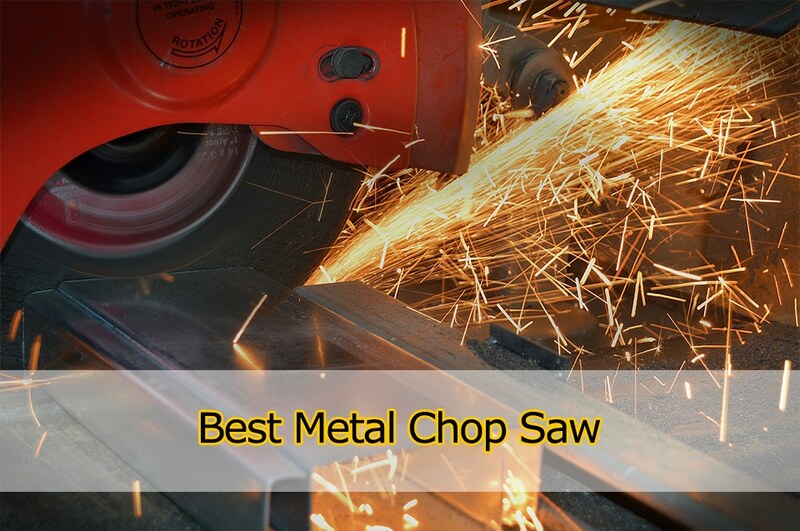 With all the great brands available, it could be a challenge to choose the best metal chop saw that suits your needs. I have put together a comprehensive review of all the best metal chop saws available. This will help you select the right one that is most appropriate for you to use. 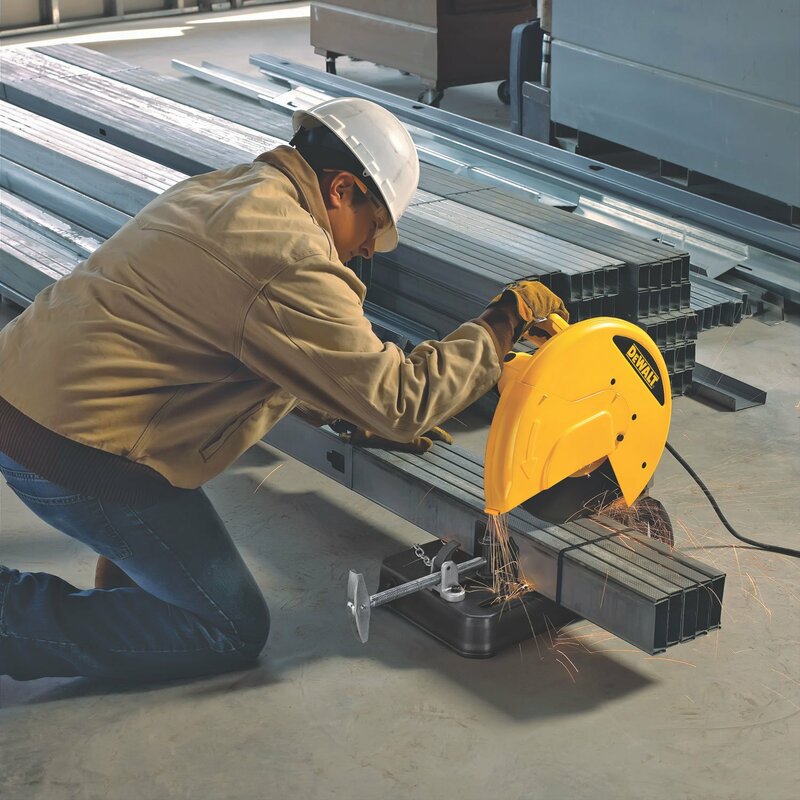 The Evolution Power Tools EVOSAW380 Steel Cutting Chop Saw can cut various metals from steel plate to i-beams to metal sheets. This dry metal cutting chop saw cuts metal with minimal heat or sparks and doesn’t require coolant. It has an 1800 watt and 15 amp motor with high torque gearbox – just powerful enough to be your ultimate metal cutting tool. This feature reduces the motor load and improves steel cutting performance. 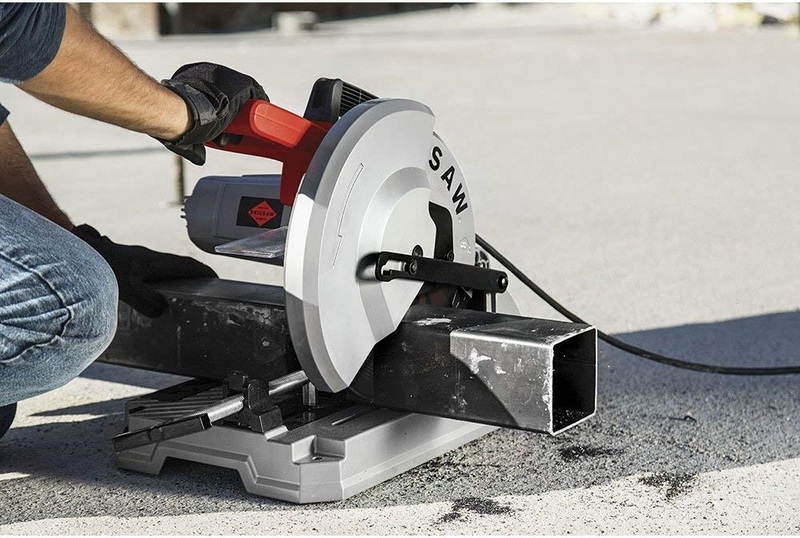 This powerful metal chop saw is top on our list. It has a heavy-duty cast aluminum cast iron base which makes it sturdy and steady. A single blade can cut up to 1,000 cuts for a mild steel measuring 2×2. This was a test conducted by Evolution Power Tools. This power tool cuts metal with minimal heat and virtually no burrs created, leaving a ready-to-work finish. The blades also produce very few sparks and are a safer alternative to abrasives because they create little heat. It has a 0-45 degree adjustable, quick-release vise, which allows a variety of cuts. In addition, it has a metal chip tray where the chips created by the saw are stored and you can just pull it and throw the chips properly. This is a great addition for this saw to make your shop clean and tidy. 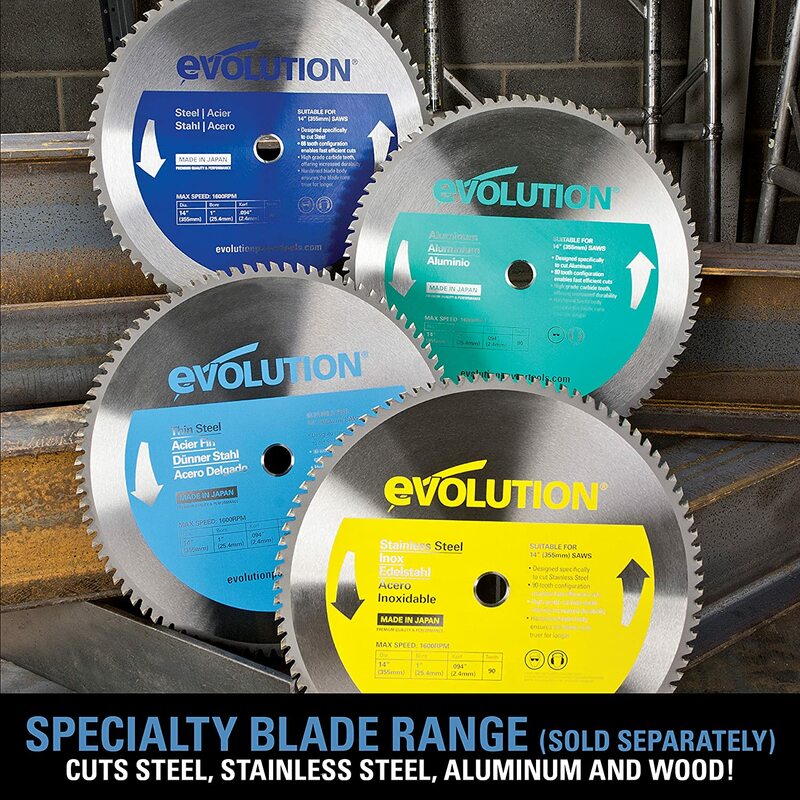 You can choose blades that cut mild steel, stainless steel, aluminum and wood. However, these blades are sold separately. The Evolution Power Tools EVOSAW380 has no sparks when cutting metal. A single steel blade can create over 1,000 cuts before replacement, saving users a lot of money. Cutting with this saw produces less heat, creating a ready to work finish. Durable housing and no plastic or flimsy parts. The handle though is made of polycarbonate. It produces precise and clean cuts. A professional grade saw with hefty price. The clamp setup is a challenge to get to 90 degrees. 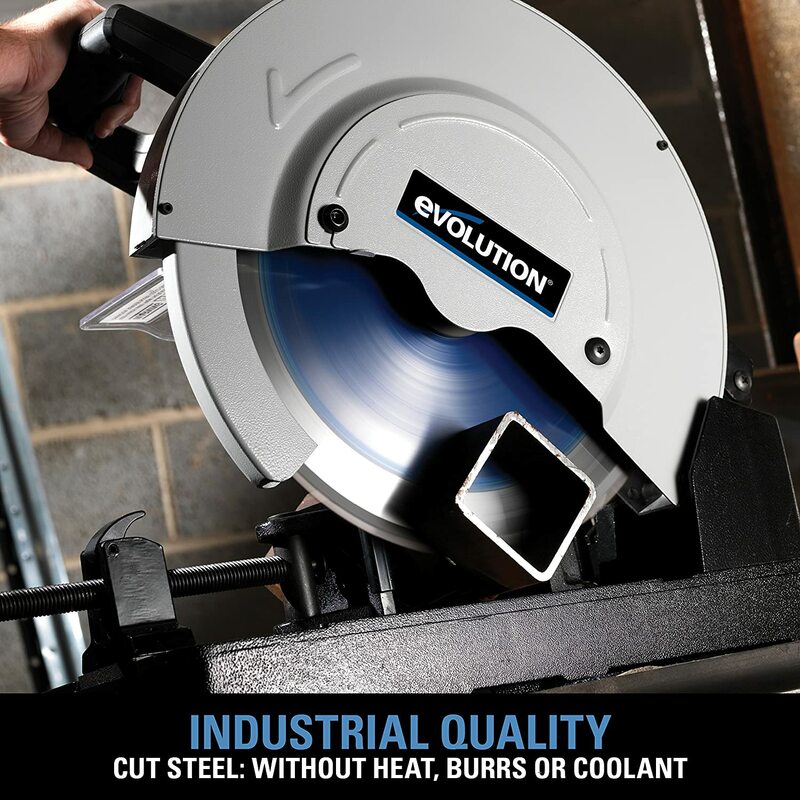 The Evolution Steel Cutting Chop Saw does exactly as it claims. It is a great investment to have and a valuable addition to your workshop. If you have commercial and industrial projects, this saw is a solid choice. The DEWALT D28710 is our second best option. If you are in tight budget, perhaps you may consider this chop saw. Its 15/amp/45 HP motor provides overload protection which increases performance. The Quick-Lock vise provides a quick clamping action on materials of various sizes, which increases productivity. This chop saw has an ergonomically designed “D” handle makes you feel comfortable while reducing fatigue and increasing productivity. The compression spring provides smoother movement and increased durability. This abrasive saw also has a spindle lock. This lets you make quick wheel changes. It can also be stored conveniently with its on-board wheel change wrench. It also has a 45-degree pivoting fence with more accurate and faster angle cuts. The adjustable spark guard allows its users to direct the sparks away from the work area. The heavy-duty quick-lock vise allows the head of the saw to be locked in the carrying position without the use of a chain. On the other hand, since this metal chop saw utilizes abrasive blades, expect a spark and heat. However it doesn’t mean it won’t produce precise cuts. See video here for metal cutting test of this chop saw. Cheaper than cold cut saws. 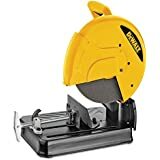 This is a well-made tool and is an excellent basic saw for doing simple cutting jobs. It is a safe-to-use saw, with a “quicklock” vise for material clamping and releasing. Since it comes with an aluminum oxide grain wheel, it helps increase its life while providing a quick, fairly smooth cut. Sparks and smokes occur when cutting metal. Slower cutting speed compared to cold cut saw. Expect burrs after cutting metal especially thicker ones. You can’t use a toothed blade for this saw because the RPM is too high for such a blade. This chop saw is a good variant if you prefer an abrasive saw. For beginners, this is a good saw to have for its price. 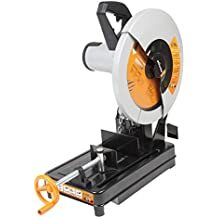 You will be using this saw non-stop to work on your DIY home projects. It is a quality saw at a very affordable price. The Porter-Cable Chop Saw – Model PCE700 uses the same blade technology like the DEWALT D28710. 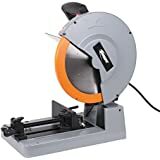 Not because of the price we ranked it good, but this chop saw has something great to provide, not to professional blacksmiths but to entry level handymen. This metal Chop Saw has a 15 amp, 3,800 RPM motor. Yes, powerful enough to cut through steel. It comes with replaceable brushes. It comes equipped with a quick-release material clamp and a cutting fence with a miter adjustment. Built for stability, it has a heavy duty steel base and spark deflectors. 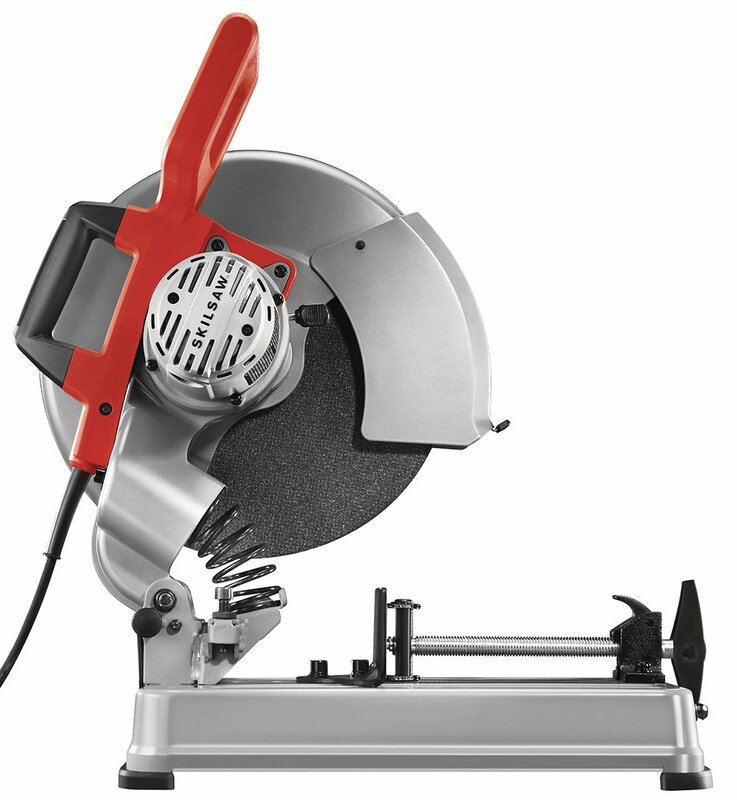 This 32-pound Porter Cable Chop Saw has a wheel diameter of 14 inch. This corded-electric, 120 volt chop saw works great for small to medium sized projects. It does what it’s made to do – which is to make more precise cuts versus a handheld grinder. Runs smoothly and has great power. More sparks produced compared to Dewalt D28710. Burrs are visible after cutting. It takes some time to get through thicker metals. This chop saw works just fine. It is an excellent saw for what it’s worth. It makes good cuts and is ideal for small to medium sized projects. Despite its mixed reviews, if you need a basic starter chop saw, this is the ideal one to buy. Brought to us by 100 year-old Makita Corporation, a company with a strong R&D division. If you have large and demanding projects, this might be a great tool for you. The Makita LC1230 12-inch metal cutting chop saw packs with out of the box features. The powerful 15 amp motor of this metal cutting saw has 120 volts and a D-shaped handle for easy gripping. It delivers 1,300 RPM – almost close as its competitor, the Evolution Power Tools EVOSAW380. 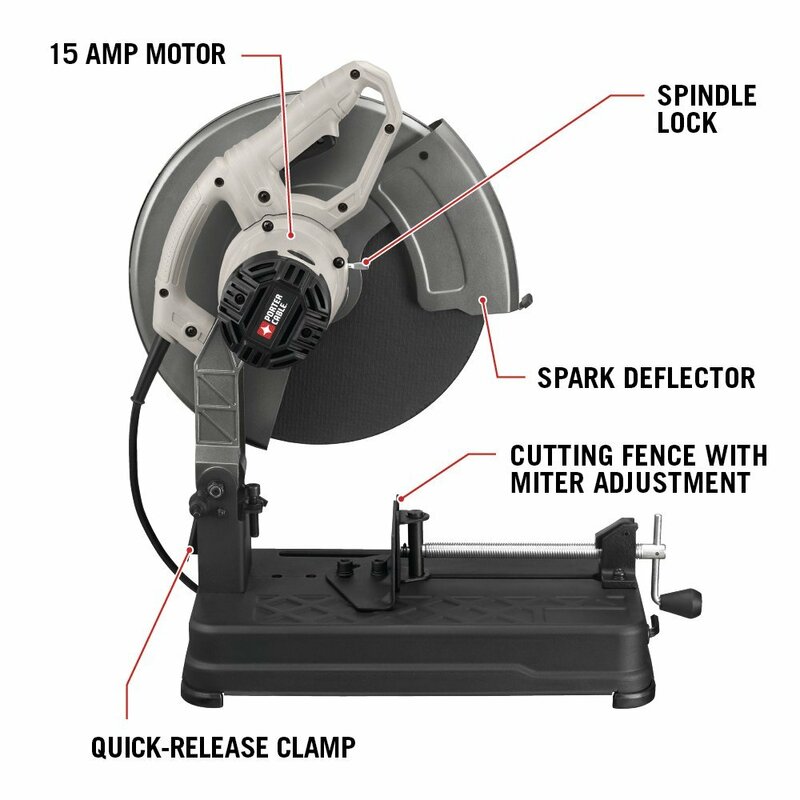 This 42.5 pounds corded-electric saw has a quick-release tool-less guide plate that adjusts from 0 to 45 degrees. Its cutting capacities are along the range of 4 ½ inches at 90 degrees to 3 ½ inches at 45 degrees. 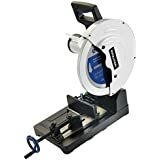 It has a convenient lever on the left of the base where you can tighten or loosen to change the cutting angle and also to secure the vise stop. You can easily prevent accidents with its lock-off button. It also features a quick release vise for secure material retention. The chop saw also includes a carbide-tipped blade that last 50 times longer than abrasive wheels. For convenient blade changes, it has a socket wrench that stores on the base. There is no need for another tool for blade changing which is another good thing about this chop saw. It also has a shavings collection tray for a neater work environment and efficiency. It comes with a carbide-tipped blade, socket wrench, switch button, and safety goggles. One drawback I see is the price of this cold cut chop saw. Not only that, the blades are also expensive so be sure to read the maintenance tips on the manual to make this tool last long. This metal cutting saw cuts metal pretty clean and accurate. Very versatile and works with various metals like light pipe, angle iron, and tubing. It is sturdy, durable, and cuts with great results. 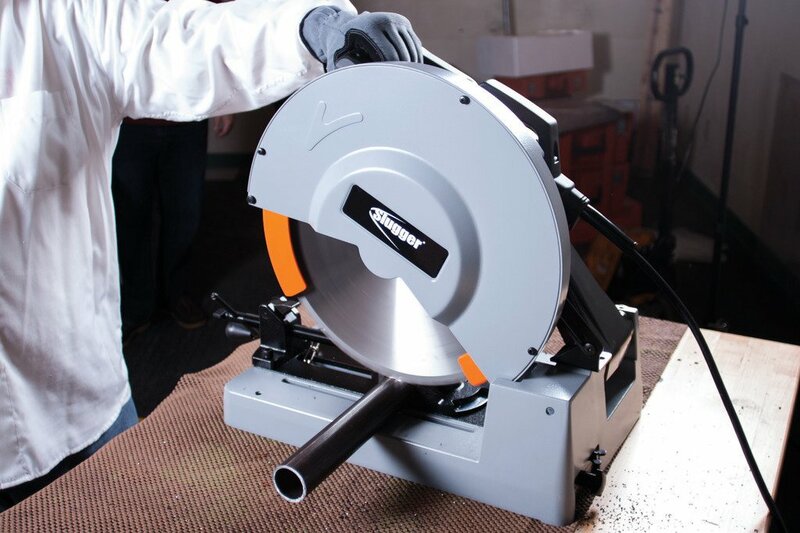 You can make very quick changes with this chop saw by giving the vise wheel a quick spin. It cuts clean at 45 or 90 degrees and cuts through metal like butter. Its quick release vise provides secure material retention. This metal chop saw comes with a hefty price as well as its blades. Ideal for a variety of metalworking applications, this chop saw lives up to the Makita name of power, performance, and capacity. Its innovative technology and world-class quality is part of the company’s commitment to have the best products for its customers. 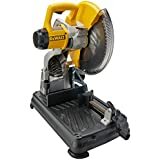 This highly-rated chop saw, which is always the top pick among users and reviewers, has performed flawlessly and is a top favorite among handymen all over the world. 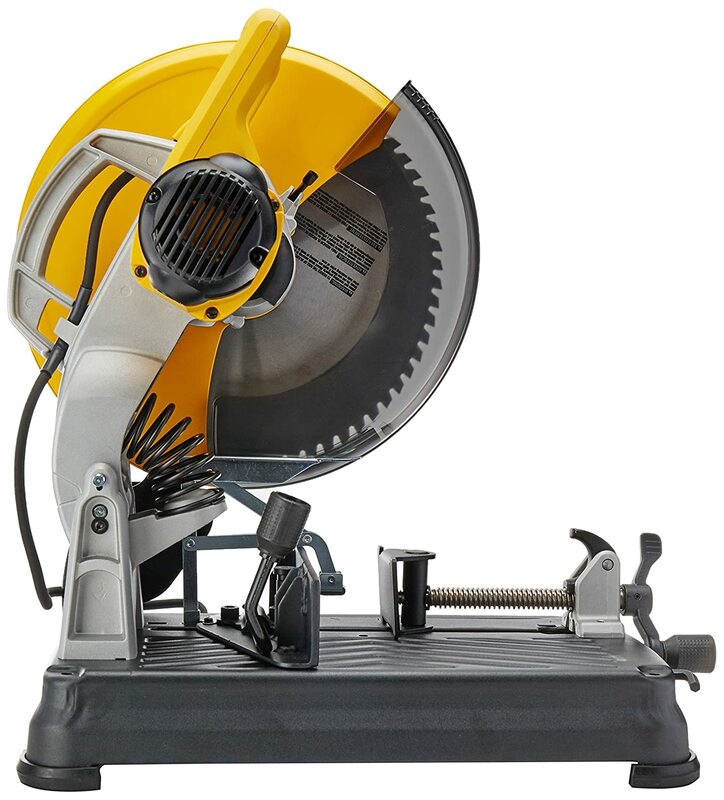 This top-performing chop saw is highly recommended versus other chop saw brands in the market. It is truly worth is more costly price. This has our stamp of approval! 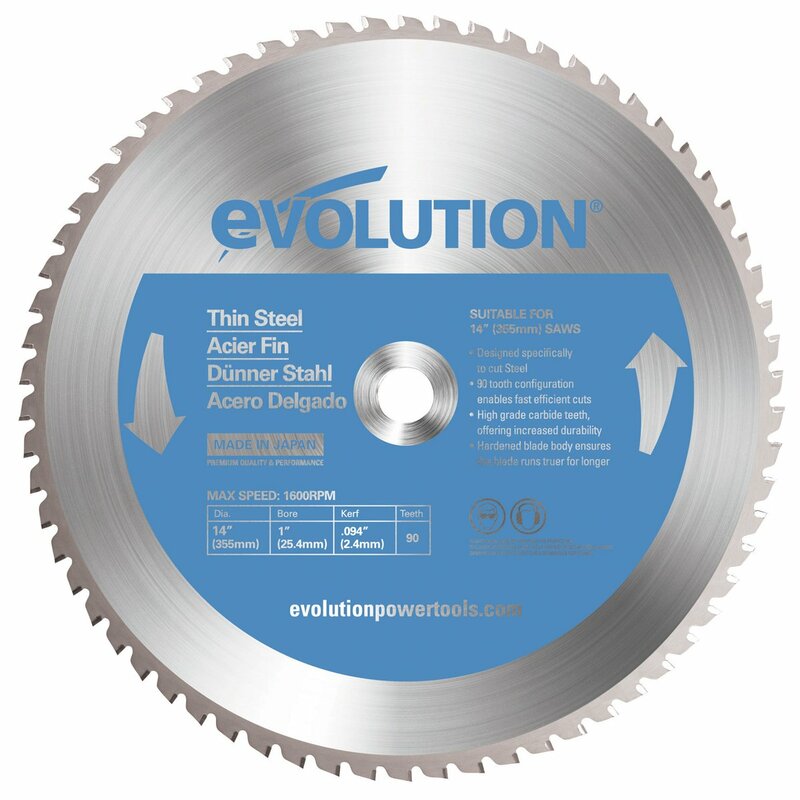 The Evolution Power Tools Rage2 comprehensively outperforms abrasive saws, proving that one TCT (Tungsten Carbide-Tipped) saw lasts longer than 20 abrasive discs. It cuts metal with ready-to-weld, accurate, clean and cold-cuts without harmful smoke. 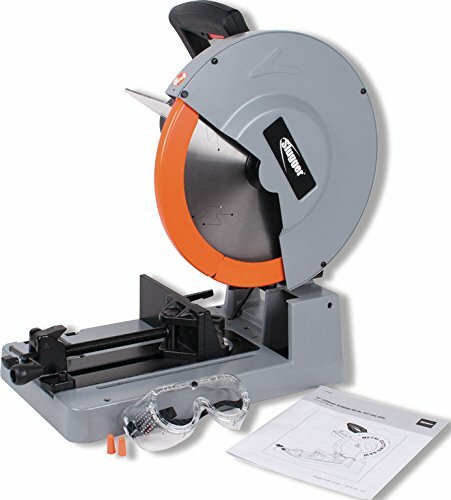 This 14-inch, 44 pounds versatile chop saw is able to cut aluminum and wood with a 36-tooth TCT blade. They guarantee no heat, no burrs, and no sparks when cutting steel. It leaves an instantly workable finish. From American company Evolution, this power tool has a 3-year limited warranty. It also features a fast action swivel clamping mechanism that allows 0-45 degree cuts. The clamp can be adjusted in seconds. The difference between the RAGE2 and EVOSAW380 is the build material and horsepower. While both have the same amperage (15 amp), the base of RAGE2 is stamped metal while the EVOSAW380 is aluminum cast iron. The RAGE is 18 pounds lighter. Also, the number of teeth blades of RAGE2 is only 36 while the EVOSAW380 has 70. This chop saw is able to cut almost everything. It leaves an instantly workable finish with no burrs left after cutting. Cuts much quicker with a lot less heat and mess. This saw produces the highest precision cuts with no sparks. Diamond blade option is available for cutting stone, brick or concrete. No metal chip collector tray. The base could be improved for steadier use like the EVOSAW380. 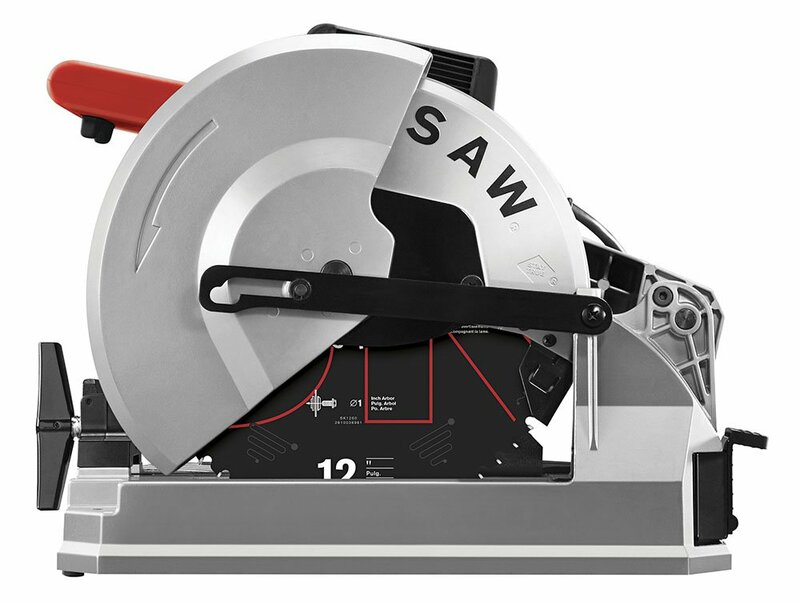 Overall, this is an ideal chop saw for a home workshop. This well-built and powerful chop saw has become the first choice for special projects. Its versatility and durability make it a highly recommended chop saw for its price. The Evolution Rage2 is truly a product that lives up to its capability. The DEWALT DW872 Multi-Cutter saw is very versatile and powerful. It cuts a wide variety of materials, including both ferrous and non-ferrous metals like vehicle scrap metal, aluminum and stainless steel. The durable carbide-tipped blade allows the depth of cut to remain constant throughout its entire blade life. 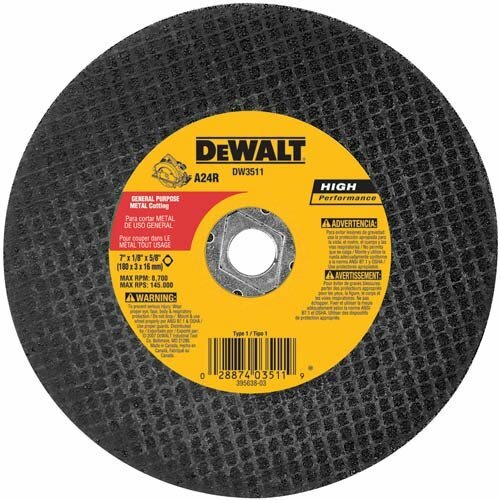 The DW872 cuts 4 times faster compared to chop saws with abrasive wheel, and 8 times faster than portable band saws. 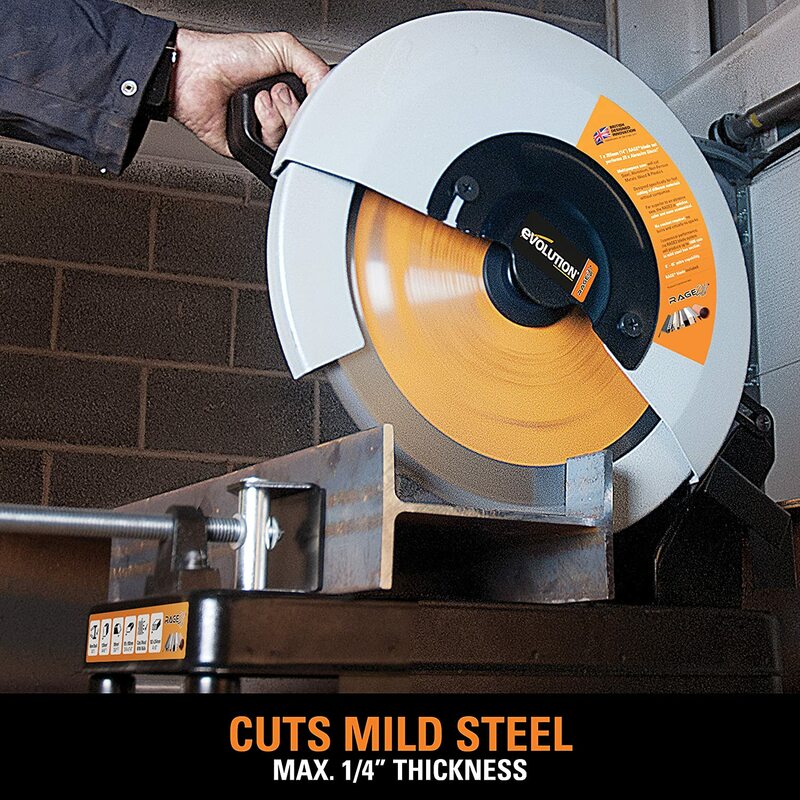 It has a 14-inch 66-tooth carbide tipped blade which delivers a lower cost per cut compared to abrasive wheel cutting. You can expect precise, burr-free cuts. 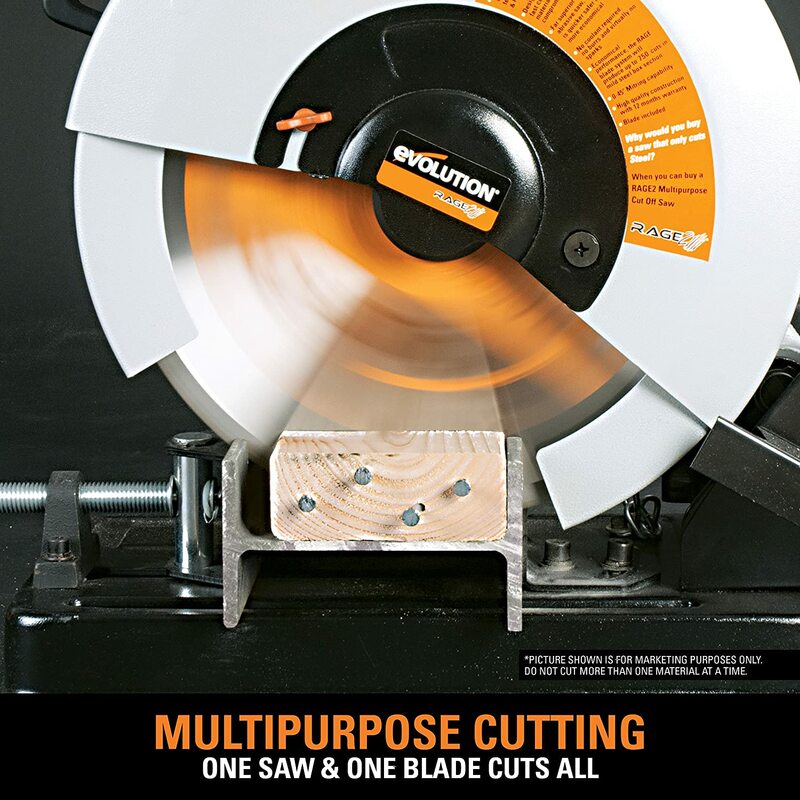 In addition, this saw allows you to cut a wider variety of different-sized materials. On the other hand, this saw should not be used on cutting materials other than metals. You may forfeit your warranty. In addition, cutting thick metals may cause some sparks but in minimal form. Be sure to have your metal chip collector ready because metal chips scatter during the cutting process and there is no metal chip tray available in this tool. Although this particular chop saw is more expensive than others, you won’t be disappointed with its great features. It’s truly a great saw that you will have for many years to come. It has long blade life which make it efficient for large blacksmith projects. When you purchase this, it will truly be money well-spent. 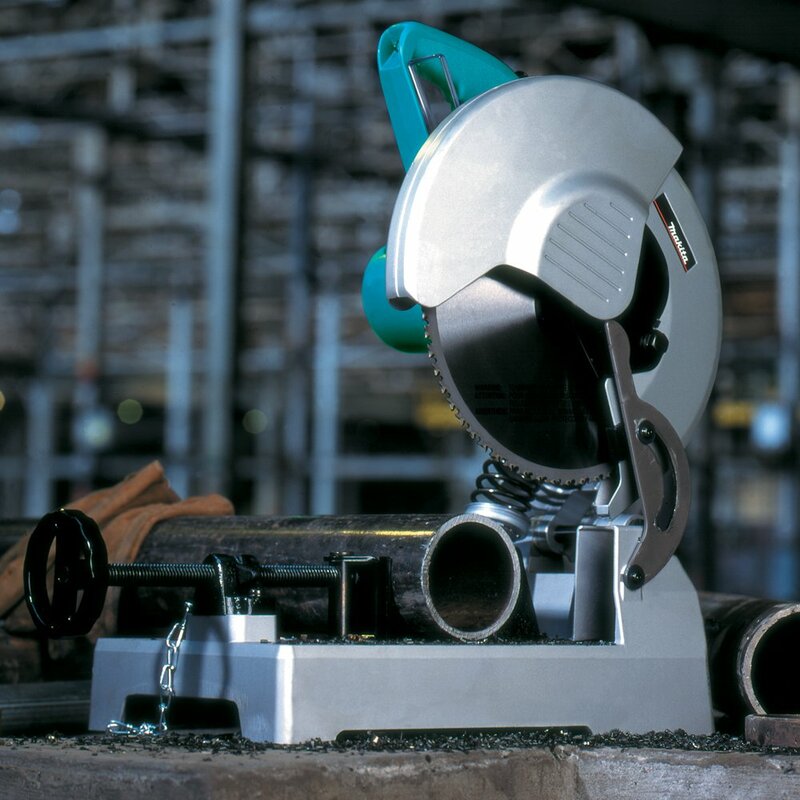 This 54-pound metal-cutting saw from the Jancy Engineering Company provides low speed with appropriate high level of torque. This means that you can make quick, clean cuts in steel, aluminum, and other metals. 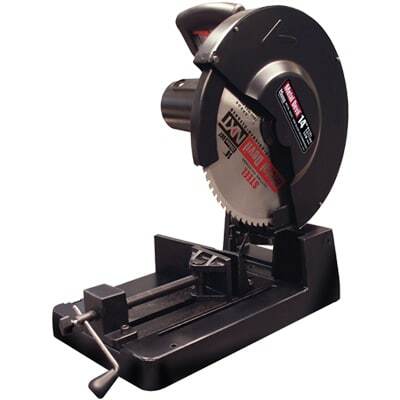 It has a powerful 2,200-watt motor which cuts material using a 14-inch mild steel saw blade. It can easily be adjusted to cut at both a 45-degree and a 90-degree angle. 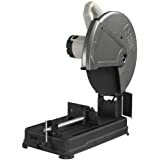 This metal chop saw has an automatic retracting lower safety blade guard that covers the whole blade which is for me a very good safety feature plus a heavy-duty base made of cast aluminum is absolutely great for stability. Also, the eye protection plate just beside the blade housing brings additional safety feature. The low speed, high torque of the Jancy Slugger MCCS14 produces very little heat during the cutting process and it prevents excessive worksite debris because it captures chips within the tray container inside the base. Expect a clean and high precision cut without burrs. You may find metal chips scatter around during the cutting process. Not all chips are thrown on the tray. Expect also a minimal sparks especially cutting thicker metals. 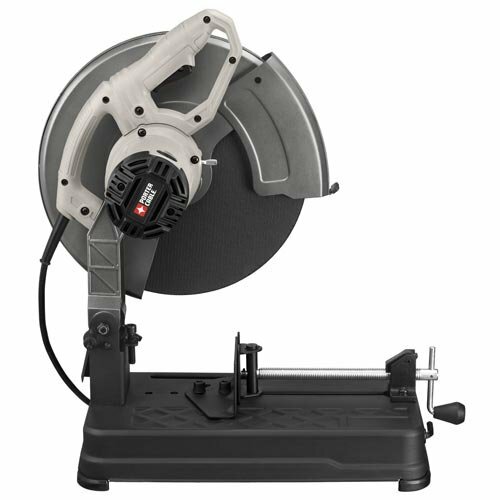 This durable cutting saw has a cast aluminum base, making it able to withstand tough conditions. The product has a lot of strengths which customers love, but its most outstanding feature is its excellent vise. Smooth, quiet, and very controllable operation. It has an ergonomically designed horizontal handle that put user’s wrist in a more comfortable position. Minimal sparks occur during the cutting process. Not all metal chips are caught on the tray. You may need an extra metal chip collector. Known for its safety and durability, the Jancy Slugger MCCS14 Metal Cutting Saw is a great product for various projects. Often described as a game changer, this excellent product boasts of top-notch performance and accuracy. This product will really go beyond your expectations. The MK Morse CSM14MB is not just built with premium quality materials, but it also performs at an excellent level on par with other cold saws like the Evolution Power Tools EVOSAW380 and Makita LC1230. Let’s start with the physical built. The base is made up with thick molded steel. It’s not as sturdy as cast aluminum but it is still good base and cutting is stable. The retractable blade guard, like the Jancy Slugger MCCS14 , is a very useful safety feature. The D handle is made with excellent quality material. Just below the horizontal D handle is the carrying handle which is absolutely important to carry and transfer this 53 pound chop saw. Below the base is the metal chip tray that collects metal chips that is spit out during the cutting process. The motor is rated at 120 V, 15 amps (60 Hz) which delivers 1,300 RPM. Expect a clean and precise cuts with no burrs with this metal chop saw. Sparks rarely occur even cutting thicker metals. Also metal chip doesn’t scatter that much around while cutting. 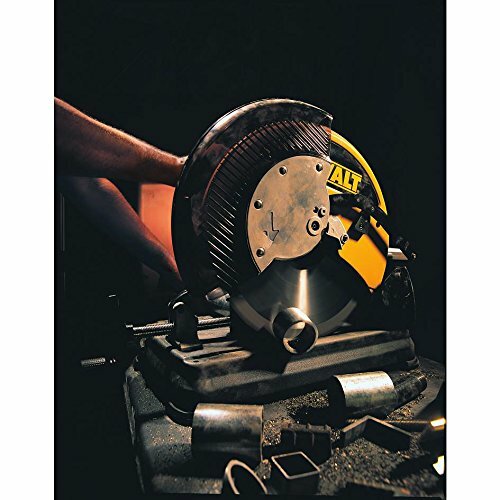 This 14-inch dry cut metal cutting saw is ideal for pipe, angle iron, metal studs, conduit, and tubing applications. The product includes a safety guard, beveling vice, 6 and 8-millimeter hex wrenches, safety goggles, ear plugs, and steel cutting blades. It also includes an on board blade change wrench for convenient storage. This metal chop saw cuts neatly and precisely with no burrs. Safety feature like the automatic retractable blade is a plus. It could use a quick release on the vise to allow faster opening. Cutting aluminum creates splinter to scatter. Only 1 year for warranty claiming. MK Morse’s benefits far outweigh its negative feedbacks. This metal cutting saw may not be as popular as the others, but it has solid built and diverse features that make it valuable to the user. Purchasing this product is highly recommended. This is a must for both professionals and hobbyists. 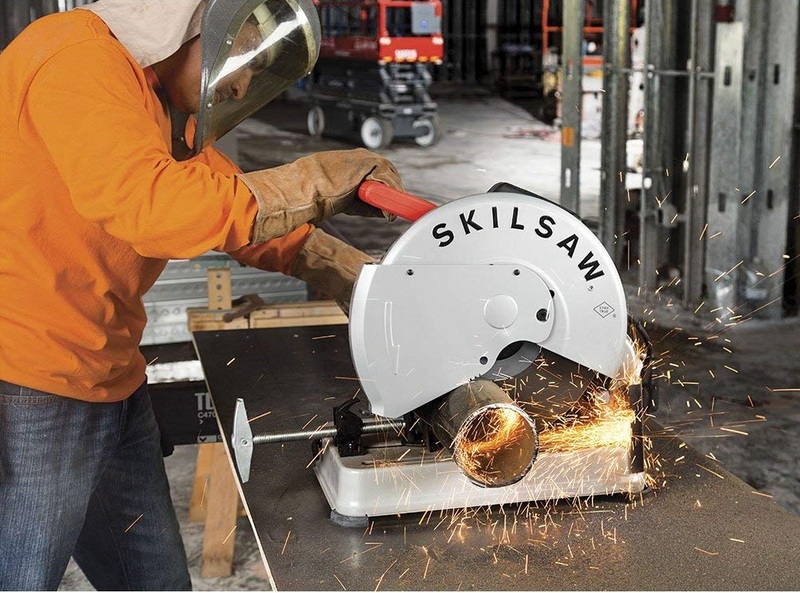 The SKILSAW SPT62MTC-01 is the lightest metal chop saw in its class. Weighing 38.2 pounds, it is 23.8 pounds lighter than Evolution Power Tools EVOSAW380 and 4.3 pounds on Makita LC1230. I’m amazed with the overall design and build of this product. I’d always prefer cast aluminum base and this saw has it. No crap or cheap component. Everything is engineered to withstand demanding cutting applications. Though the SKILSAW SPT62MTC-01 is not very popular, this chop saw is worth a try. Minimal sparks still occur but the cuts are clean and precise. There are no burrs left after cutting. This is always an advantage when getting a metal chop saw. This saw produces precise and clean cuts. Constructed with a heavy-duty cast aluminum base. Lightweight compared to top competitors in the market. Only a year for warranty claims. 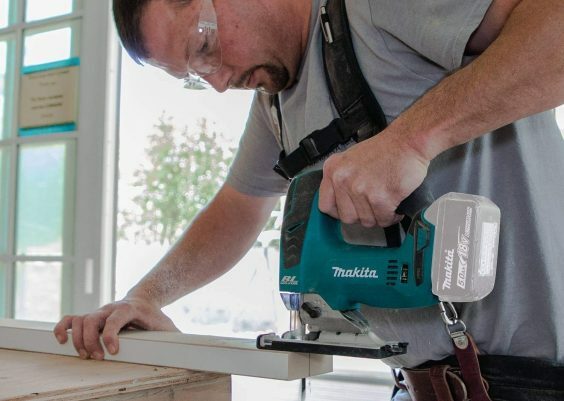 The Skilsaw may not be popular like other top competitors like Evolution Power Tools, Makita or Dewalt, you can still expect a clean, precise cuts. It is impressively versatile and powerful but has a compact frame. This saw goes above and beyond expectations. Purchasing this tool is truly worth a try. 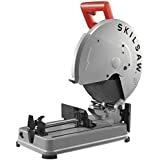 The Skilsaw SPT64MTA-01 abrasive chop saw, just like the SKILSAW SPT62MTC-01, is a lightweight cutting tool in its class, excepts it has an abrasive blade and a stamped steel base. This saw can cut non-ferrous metals but expect burrs after cutting. The ergonomic D handle is a good improvement of this saw. Just 33.9 pounds you can easily carry or transfer this tool anywhere on your workshop. The saw throws a lot of sparks – you can’t see how the cutting process works. Also, the blade guard wobbles. 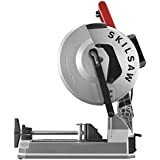 I think this is where the Skilsaw should improve this saw. In addition, the miter fence should be adjusted with a wrench that is included in the base. This tool cuts a huge variety of metals. It is lightweight in its class. It cuts precisely even with thick metals. Throws a lot of sparks. You need a wrench to adjust the miter fence. The Skilsaw Skilsaw SPT64MTA-01 Abrasive Chop Saw is a powerful tool that makes a big difference in your work. This saw is not a good option for large projects but worth a try for DIY projects small blacksmith works. First of all when you are researching for metal chop saws, you need to be aware that the term is used interchangeably with cut-off saw or a cold cut chop saw. Buying a metal chop saw with a good blade is essential. However, all blades are not made the same. An excellent blade cuts through a thick steel in seconds. Metal blades should cut cleaner and with more accuracy. There are two blade types to know about when buying a metal chop saw. The Cold Saw Blade and Abrasive Blade. Abrasive blades usually produce a lot of sparks and leave the material piping hot after the cut is made. On the other hand, a cold saw blade cut through metal with little to no sparks at all. It will also leave the material cool to the touch right after the cut is made. Cold saws use a metallic toothed blade instead of a high-friction abrasive type blade. 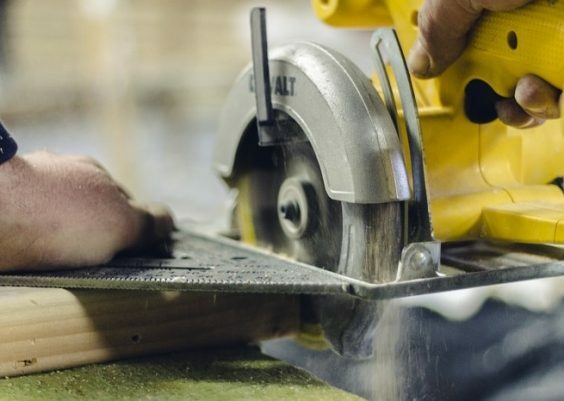 Cold saws cut material faster than an abrasive blade chop saw. When an abrasive blade wears down it gets thrown out in the trash, while a cold saw can be sharpened. 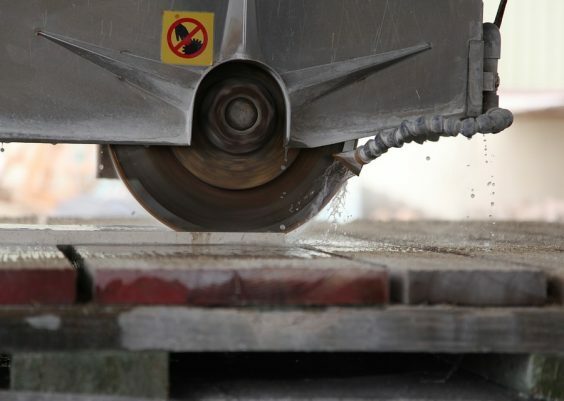 Both types of saws create cuts on metal by the user placing a spinning circular saw blade down onto the material that you are working on in a short, controlled motion, guiding it into the size and basic shape you want it to be. The blade guard retracts as the blade gets down on the workpiece. The material or workpiece is usually held against a fence. This fence provides an accurate cutting angle, which in standard for, is at 90 degrees. Cold saws have a much lower blade speed versus an abrasive blade chop saw. For certain applications, cold saws offer more advantages such as producing smooth surface finishes and the ability to cut thin sections with less tooth damage. Cheaper blades have a tendency to wear out quicker. They also leave a rougher cut. High-quality blades are usually composed of a composite carbide material. The disc on these blades will cleanly cut metal without leaving a lot of burrs or debris. In addition, top-notch blade models also include a hood to the blade. This is used to protect you from splinters as well as flying sparks. The most common blade sizes for hobbyists are the 14 inch and the 12 inch wheels. Blade sizes are also available in 8 inch and 10 inch. Please note that you should not interchange the abrasive blade to a cold saw blade or vise versa. You will damage the blade once you cut a metal. You will forfeit your warranty for sure. A chop saw should have at least a 15 amp motor, especially if you regularly cut any sort of tubing for cages and bumpers of motor vehicles. The maximum motor horsepower for chop saws is 4HP. Chop saws that have 4HP and a 15 amp motor is top-of-the line and will definitely increase productivity. The recommendation is to look for a chop saw that has a strong motor but has low speeds. The reason behind this is because it causes little to no spark. A sturdy vise is also necessary for excellent chop saws, because its main function is to lock the tool in place. There are some chop saw vises that have a quick-release or quick-lock feature. It is recommended that you choose these saws because this allows for quick clamping on various sizes of materials, which increases productivity. The fence provides an accurate cutting angle between the plane of the blade and the plane of the longest workpiece edge. Without a fence, you won’t be able to make effective cuts. An adjustable angle fence is convenient because you will be able to position the workpieces at precise angles. Most chop saws have spark deflectors. As the name suggests, it is used to deflect sparks away from surrounding persons and materials. Make sure that the spark deflectors are adjustable. A good metal chop saw always has safety features. It includes a blade guard or an eye protection plate. Please note to wear proper protective gears whenever cutting with metal chop saw. Most metal chop saws have 3 year warranty. Look for an extensive warranty in case the metal chop saw break.